Pest description and crop damage Asparagus beetle larvae are dark green-gray grubs about 0.33 inch long when fully grown. Adults are blue-black beetles with a red section on their backs (prothorax). Their wing covers have yellow spots and red borders. 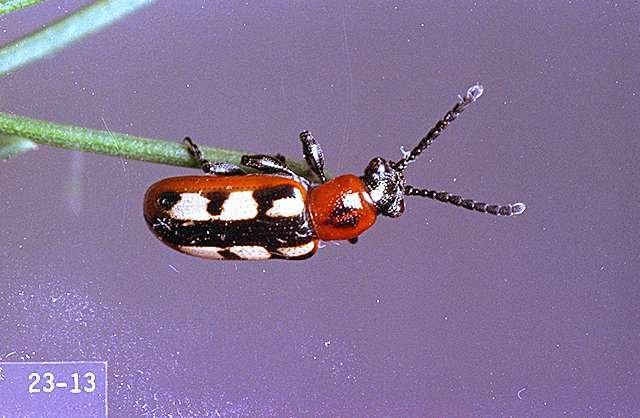 Asparagus beetle adults injure plants by feeding on the tips of tender young shoots. After leaves come out, asparagus beetles and their larvae gnaw on the surface of the stems and defoliate ferns. If injury to the fern is severe, the crown is weakened, particularly if the asparagus stand is young. Biology and life history Adults overwinter in plant debris along field margins and fence rows and in hollow stems of old asparagus plants. Adults emerge in spring and deposit eggs singly or in rows on the shoots of the asparagus, making them unmarketable. 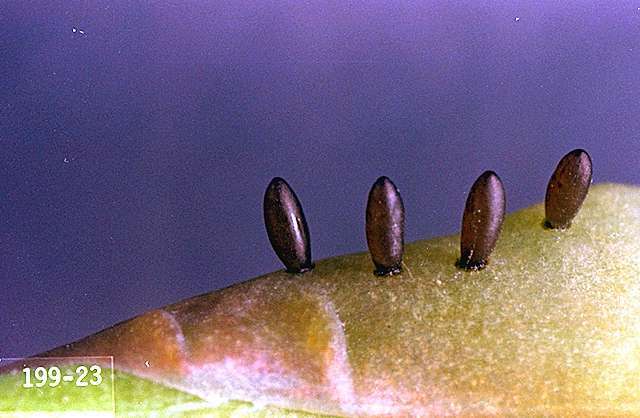 Eggs hatch in 7 to 10 days, and larvae begin feeding on the young shoots. 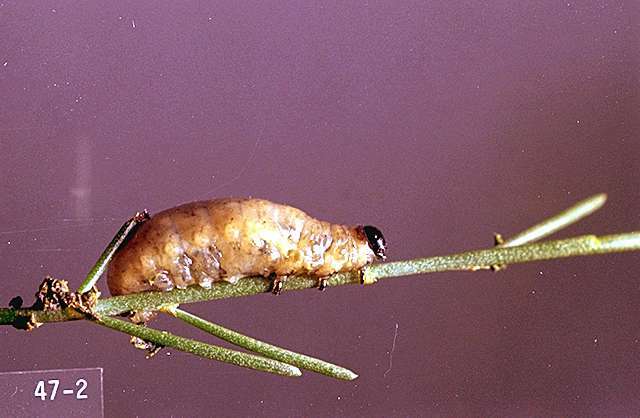 Larvae feed for 2 to 3 weeks before burrowing into the soil and pupating. Adults emerge in 1 or 2 weeks and deposit eggs for another generation. The entire life cycle takes about 1 month. There may be two or three generations each year. Pest monitoring Monitor visually for adults early in the year. Populations tend to be clumped. Larvae of lady beetles and predaceous plant bugs may reduce the number of larvae. In British Columbia, a parasitic chalcid wasp is common and may be important in regulating the population. Where asparagus is cut for market, injury may be reduced by cutting the crop clean every 3 to 5 days. Destroy volunteer plants and remove plant debris around field margins. If beetles are feeding on spears early in the year, let some plants near the edge of the field produce fern growth to attract the beetles away from the spears. Treat these areas. carbaryl (Sevin 4F) at 1 to 2 lb ai/a. PHI 1 day. REI 12 hr. Do not exceed 5 lb ai/a per year. Repeat applications no more than three times prior to harvest or five times per crop. Latex-based formulations, such as Sevin XLR Plus, are less hazardous to bees. chlorpyrifos (Warhawk,, Lorsban Advanced) at 0.45 to 1 lb ai/a. PHI 1 day. REI 24 hr. Do not exceed one preharvest and two postharvest applications per year. dimethoate (Dimethoate 4E) at 0.5 lb ai/a following harvest. PHI 180 days. REI 48 hr. Retreatment interval 14 days. Do not exceed 1 lb ai/a per season. malathion (Fyfanon 8) at 1 to 1.25 lb ai/a. PHI 1 day. REI 12 hr. Do not exceed 2 treatments per season. Retreatment interval 7 days. methomyl (Lannate SP) at 0.45 to 0.9 lb ai/a. PHI 1 day. REI 48 hr. Do not exceed 4.5 lb ai/a per year. Do not exceed 8 applications per year. permethrin (Ambush 25WP, Pounce 25WP) at 0.05 to 0.1 lb ai/a. Apply using ground equipment only. Use a minimum of 10 gal/a. PHI 1 day. REI 12 hr. Do not exceed 0.4 lb ai/a per season. Retreatment interval 7 days. spinetoram (Radiant SC) at 0.0313 to 0.0625 lb ai/a postharvest. PHI 60 days. REI 4 hr. Retreatment interval 4 days. Do not exceed three applications or 0.188 lb ai/a per season. Follow resistance management procedures on the label. Ferns only. spinosad (Success, Entrust SC) at 0.062 to 0.094 lb ai/a applied after harvest. PHI 60 days. REI 4 hr. Do not exceed three times in a 30-day period. Do not exceed 0.28 lb ai/a per crop. Do not feed treated ferns to meat or dairy animals. Ferns only. Entrust SC is OMRI-listed for organic use.